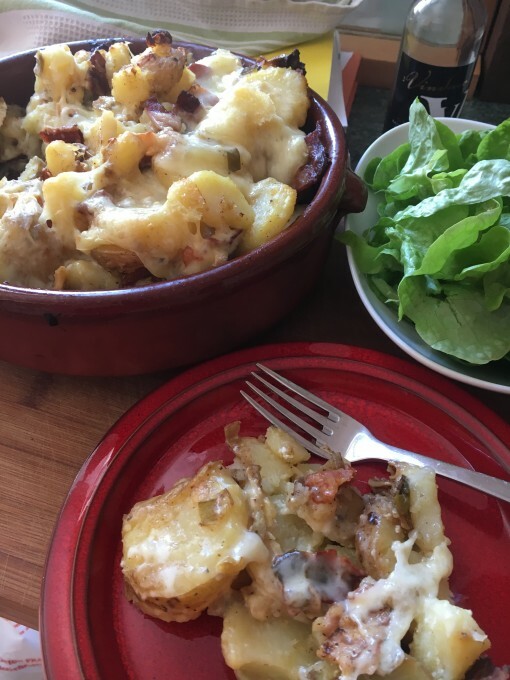 There are many reasons to make a tartiflette; primarily because its delicious! Secondly because it goes wonderfully well with so many accompaniments; namely pickles and chutneys. Finally it gives an excellent excuse to buy one of Monsiuer Berenguel’s ‘Meuh’-blochons (or Reblochon to the rest of us!) from his stall on Amelie-les-Bains’ Thursday market. This Reblochon is made from the milk of his cows which graze happily on the high slopes of the Vallespir. However, an off-the-shelf Reblochon is more than satisfactory! I also use Monsieur Berenguel’s natural yoghurt instead of the more traditional crème fraiche in the recipe. I strain off the excess moisture using a sieve lined with kitchen roll. It isn’t absolutely necessary to peel the potatoes after they are cooked, especially as the skins are adding nutritional value, so only peel them if you prefer a more refined dish! Cook the potatoes in salted water until tender, then drain, and when they are cool enough to handle cut them into thickish slices. Heat the butter and olive oil in a medium/large frying pan then saute the bacon until golden and crispy. Remove the pan from the heat and using a slotted spoon scoop out the bacon and drain it on a couple of sheets of kitchen roll. Return the pan, including the delicious bacon fat, to a medium heat, add the onions, garlic, and a couple of tablespoons of water and sweat gently until soft, sweet and golden. Remove the pan from the heat and using a slotted spoon scoop out the onion and garlic onto a couple of sheets of kitchen roll. Return the pan to the heat, and add half of the potato slices. Toss the slices of potato to coat them in the oil, and saute them until parts of the potato turn a little golden and have absorbed much of the delicious butter, olive oil and bacon fat. Spoon the potato slices out of the pan with a slotted spoon and put them into a large bowl. Add a little more olive oil to the pan if necessary, and saute the remaining potato slices. When these are golden brown add them to the bowl with the first batch. Tip the crispy bacon, the onions and garlic, into the bowl with the potatoes and toss everything together. Add the yoghurt and toss everything together to coat. Tip the mixture into your cassoula or gratin dish. Arrange the slices of Reblochon evenly over the top. 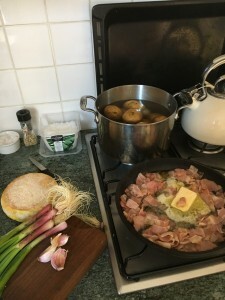 Then lay a piece of baking parchment over the top of the dish – this will prevent the cheese from burning while the Tartiflette is in the oven. The baking parchment can be remove for the last 5-10 minutes if the top of the Tartiflette is not golden brown. Bake the Tartiflette until the dish is piping hot, the cheese has melted into the potatoes and the top has turned a very light golden brown; this will take about 30-40 minutes. Serve with salad leaves and sourdough bread.